INDIANAPOLIS -- A Bloomington, Indiana auto dealership was told to stop selling cars after the Indiana Secretary of State's Office discovered the business is not licensed in the state. The secretary of state's office issued a cease and desist Friday to H Auto for selling cars without a license and illegally issuing interim license plates. H Auto has been advertising in English and Chinese and allegedly may have been targeting Chinese students at Indiana University, according to the secretary of state. The advertisements say to make an appointment because H Auto does business by appointment only, but typically most dealerships do walk-in business. Some customers of H Auto allege that they were sold cars with fake New Jersey license plates. 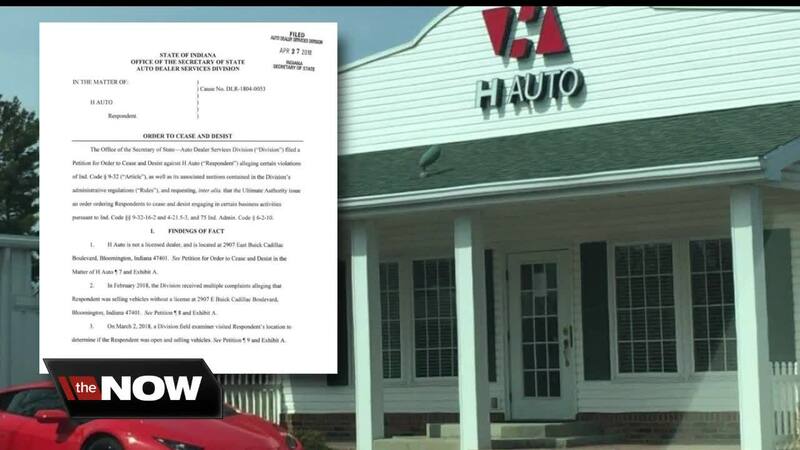 Others allege the auto dealer took their money but they never got a title for the vehicle they purchased. The secretary of state's office and Bloomington police are currently investigating.